The scene where former bombardier Captain Derry jumps over the soda fountain to punch a man when his armless friend, Homer, couldn't. He ends up knocking him out and into a glass display counter, shattering it. This was a clear case of battery, but he instead gets fired and walks out without being charged. Captain Derry takes offense at this and asks him to leave. The man does--he wants to pay his check and leave, but Homer intercepts him, rips off the man's American flag lapel pin and and says he wishes he had his hands so he could punch him in the nose. 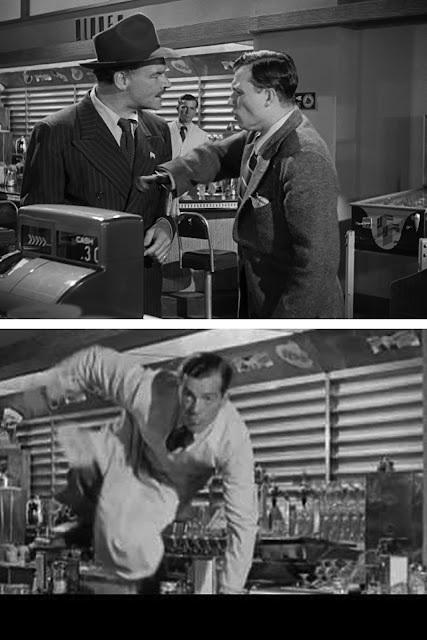 Captain Derry promptly jumps over the counter to punch the man in the jaw. It bothered me when I first saw it and it bothers me even more today. That man was entitled to his free speech even if it was seen as unpopular--or even offensive. The two veterans had made a courageous fight for the country and our Constitution. They had been fighting for freedom. They were fighting for the ability of people to speak their minds without fear. They could have dealt with the man's comments by offering debate or ridicule. They could have laughed him off. They could have ignored him. But no--they had to resort to physical violence to shut him up and they failed to see the sad irony of their actions. Everyone is entitled to free speech without fear of losing their means of making a living. People should be able to speak their mind without fear of a brick upside the head or other kinds of physical violence. Sadly, what I saw in the movie is now similar to the behavior exhibited by the SJWs--the Social Justice Warriors. If they come across opinions with which they object, they start getting angry just like Homer did. They threaten violence. They do not want to engage in debate--they want to silence people. Yes, I too wanted to sock people in the jaw not too long ago. Trolls were defaming me, distorting my work into racist hate and generally trying to prevent me from getting work. Libel is actionable and not free speech. It's not free speech when someone creates a doppelgänger to defame someone. That is, stealing someone's name, their face, and defacing copyrighted work in order to ruin a reputation with the intent of preventing their victim from getting work. It's a crime to do that, even though it's a very difficult crime to prosecute. I no longer want to hit anyone and I no longer care what anyone says about me. With some hard work and help from my wife, I've reclaimed my own voice. I also gave up the fear and anger. The trolls have sensed their defeat and have given up. It's about time. Sure, I still get hate mail, but that's their freedom of speech and their silly name calling does not make much of an argument.